SEPTEMBER 2011 VOICE: No sooner had Chapter 69 become law, than Arlingtonâ€™s board of selectmen voted 4-0 to move forward and join the state Group Insurance Commission (GIC). Right behind them, Somerville Mayor Joseph Curatone also began the move to the GIC. Other communities, from cities, such as Fall River and New Bedford, to the smallest Berkshire towns are now weighing how to proceed. Essentially, Chapter 32B (municipal health insurance) now provides multiple options as to how to negotiate and design local insurance benefits. JULY 2011 VOICE: With pension reform in the spotlight for three years and still underway, municipal health insurance reform has temporarily pushed pensions to the back-burner as the House and Senate have tackled head-on the long-simmering municipal health insurance quandary. The battle, now being waged in Wisconsin over the rights of public employees to collectively bargain, should come as no surprise to Association members. 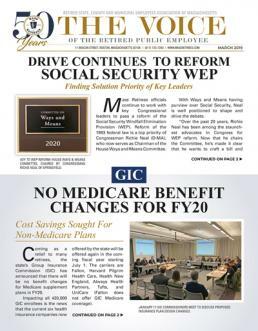 As we have been reporting for some time, there is a growing national movement to reduce and alter the health care and defined benefit pensions of public employees and retirees. Filing his third barebones budget in as many years, Governor Deval Patrick has proposed a significant change to local health insurance plans in an attempt to plug growing budget deficits that are the result of the ongoing economic recession. In addition to slashing the budget of the stateâ€™s Group Insurance Commission (GIC) by $100 million for FY12, the Governor is also proposing a 7% cut in non-school local aid to cities and towns. In order to offset local aid cuts, Patrick has reintroduced a plan that could drastically alter municipal health plans. SEPTEMBER 2010 VOICE: Heeding calls not to violate the rights of active and retired local employees by eliminating health care bargaining rights, the Legislature has rejected a scheme devised by local officials to gain control of health insurance â€œplan designâ€.